Chinese New Year, a time of year where millions of Chinese people fly across the world to reunite with their families and celebrate this momentous occasions. Common celebration activities include the exchange of Red envelopes, watching the CCTV Chinese New Year Gala, and feasting — lots and lots of feasting. Although not as celebrated as Christmas, Chinese New Year has become an important holiday in Western countries as well. With the number of Chinese nationals increasing outside of China, Chinese New Year celebrations and customs have also become commonplace in countries such as Canada and the United States. This also marks a unique opportunity for brands to engage with Chinese audiences living abroad, and help bring a little taste of “home” into their lives. Digital red envelopes have taken the Chinese community by storm since their introduction several years ago. In China, brands large and small have taken advantage of the feature to promote themselves during Chinese new year. Some notable campaigns include Alipay’s Blessing Card Red Envelope campaign, which saw millions of people sign up, engage on, and share the Alipay app to get a chance at the 200 million RMB prize pool. Traditionally, these tactics are only available for businesses in China. However, with WeChat Pay and Alipay becoming more available in North America, and the recently added overseas credit cards binding feature on WeChat Pay, it is now possible to use digital red envelopes to engage with Chinese audiences outside of China. There are many creative ways to utilize the digital envelope feature on WeChat to generate engagement. From random draws to lotto style money trees, there are new spins to the formula every year. However, one of the simplest and most proven strategies is the tried and true “follow to receive a digital red envelope”. The idea is simple, follow the account and you will receive a small digital red envelope (usually a lucky number like 8.88 RMB). Despite the monetary amount being very small (approximately $1.50 USD), the campaign has tremendous viral potential due to its implied meaning and fit with the holiday. In Chinese culture, a red envelope is often associated with good luck and the number 8 is associated with making more money, so any strategy that touches on these two elements would naturally be very popular with the Chinese crowd. What do Chinese consumers do with things that are popular? They tell their friends about it. As more and more people share the red envelope event with their friends, the cost of follower acquisition decreases, making this one of the most cost-effective methods to obtain followers on WeChat. This strategy is executed through the use of WeChat approved third-party apps. It is only available to WeChat accounts that have Wechat pay enabled. The number of red envelopes given out can be capped; one WeChat account can only claim a red envelope once, and the amount given can be adjusted at any time. Every year, major brands create beautiful Chinese New Year limited edition products to commemorate the occasion. This is especially true for luxury fashion and beauty brands such as YSL, Gucci, Celine, Estee Lauder, and so on. While these brands have major appeal and will bring lots of shoppers to retail stores, what really drives trends and must buy items are Chinese celebrities and the more accessible Chinese influencers. Similar to Chinese celebrities, Chinese influencers have a legion (often 10K to 500K) of loyal followers albeit in much smaller sizes. They have a tremendous influence on their fans as followers strive to become more like their idols. Often what this means is wearing the same brands as the influencers, using the same products as the influencers, and going to the same places as the influencers. While this influencer follower relationship is true in Western pop culture, it is particularly amplified in Chinese culture. This is precisely why working with Chinese influencers during Chinese New Year makes so much sense for Western brands. Through collaborations such as sponsored videos and content, brands are able to reach their targeted Chinese demographic in a format that’s highly receptive to the Chinese audience. Couple that with beautiful Chinese New Year limited edition items, it won’t be long before customers show up demanding to have the same products as the influencers displayers in a particular video. 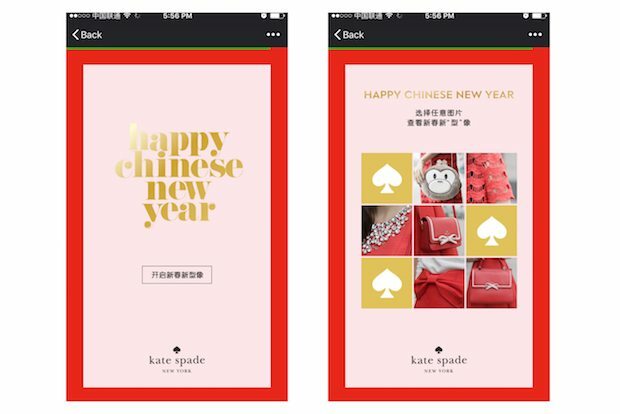 For more tips and guides on how to set up your Chinese New Year marketing campaign on WeChat, refer to our WeChat Advertising Guide.